The 68-year-old was the soapie’s longest standing cast member and died in hospital on Wednesday night. News of the death of actor Sandy Mokwena, best known as Bra Eddie Khumalo in the e.tv soapie Scandal!, spread on social media yesterday. 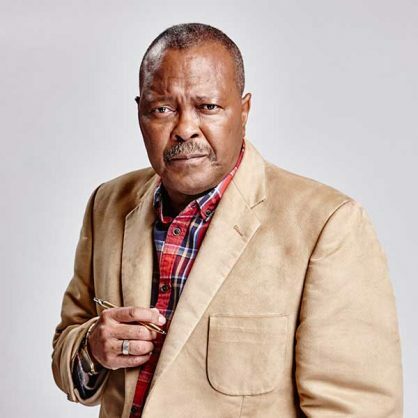 For more than a decade, Mokwena was known for his role of Bra Eddie, a respected and award-winning journalist, in the series. According to reports, e.tv spokesperson Michael Pocock confirmed Mokwena’s death. “The cause of his death is still being determined,” he said. The actor appeared in television series including Generations, Soul City, Okavango, Khululeka, Going Up, Yizo Yizo, Justice for All and Zero Tolerance. He also starred in feature films Taxi to Soweto, Dead End, The Principal and Scarback. Mokwena toured the world with hit musical Ipi Tombi in the ’70s and ’80s, playing the role of the narrator, Cappie. An outpouring of tributes have filled social media from fellow actors and fans. “Our hearts are shattered. Rest in peace Papa wa Rona (our father), Bra Sandy. A devastating loss to our @etvScandal family. Condolences and prayers to Mokwena family,” wrote fellow Scandal! actress Kgomotso Christopher. “Bra Sandy held my hand when I started directing at @etvScandal. He’d call me to his table during breakfast and say ‘keep your head up, you’re doing good’,” recalled director and filmmaker Mmabatho Montsho.